EPFO services are now available on the Umang App (Unified Mobile APP for New Governance). Umang App allows you to download EPFO passbook on the move. Umang is a single app for availing various government services. The services offered by Umang Includes Passport Seva, DigiLocker, EPFO services, NPS etc. You can download Umang App from App stores such as Google Play and iTunes. 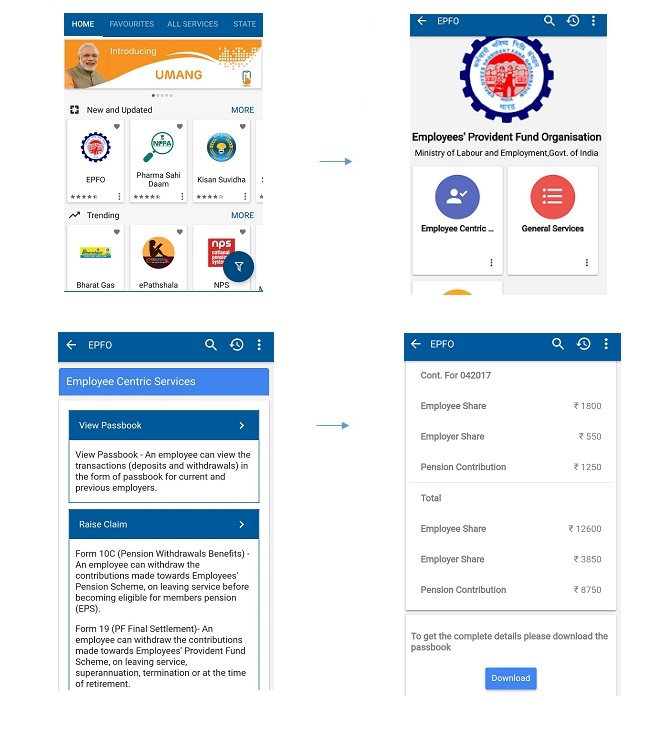 In this post, I will share details about How to Download EPFO Passbook via Umang App. How to Download EPFO Passbook via Umang App? First download and install Umang App on your smartphone via app store or website. When you open the app you will be prompted with language selection. You have the option to select multiple languages as this app support multiple languages. The next step is to provide your mobile number for the registration. Once you provide your mobile number app will generate OTP for the verification. After OTP verification you need to provide MPIN 4 digit numeric number to protect your Umang Account against unauthorized access. After providing MPIN this app will ask security questions for recovering account. Next step is to provide your Aadhaar Details and Profile information. Please note that It is not mandatory to give your Aadhaar information you can skip this step. Once you are done with above step screen will display tabs of various services like EPFO, NPS, ePathshala, Bharat Gas, Kishan Suvidha etc. In order to download EPF passbook click on EPFO icon. The app will display three tabs General Services, Employee Centric Services and Employer Centric Services. Click on Employee Centric Services. Here you will be able to see View Passbook and Raise Claim section. Click on View Passbook section and provide your UAN number. OTP will be sent to your mobile number registered with EPF account. Enter OTP and you will be able to see your passbook. Just scroll down and you will be able to see an option to download passbook in PDF format. Apart from viewing and downloading EPF passbook, this app can also be used for the following purposes. Umang App is a wonderful app that provides access to almost every e-Gov services ranging from Central to Local Government bodies and other citizen-centric services. As per me, this wonderful facility of downloading EPF Passbook on the move. I hope the information given here will help in downloading EPF passbook. Can I open KVP and NSC through online mode? Yes, You can open KVP,NSC online using Post website.I have not tried Umang App for opening KVP or NSC.